Laparoscopic exploration showed a very distended and inflamed gallbladder with omental wrapping, which was divided with blunt dissection and diathermy. The gallbladder was found to be congested with gangrenous patches, free from the liver, and twisted counterclockwise 360° around the cystic duct (Figure 2). No gallbladder fossa was seen on the inferior edge of the liver. The cystic duct was explored and an operative cholangiogram was performed to clarify the anatomy. During laparoscopic cholecystectomy, the cystic duct was clipped and the gallbladder, which was hanging in front of the liver, was removed. The patient had an uneventful postoperative period and was discharged home 2 days after the operation. Histopathologic analysis showed chronic cholecystitis and evidence of chronic ischemia. This rare surgical condition happens when the gallbladder twists along its long axis. The 2 requirements for gallbladder torsion have been classified as predisposing and triggering factors. Predisposing factors may be congenital or acquired, while our knowledge about what actually triggers the torsion is limited. 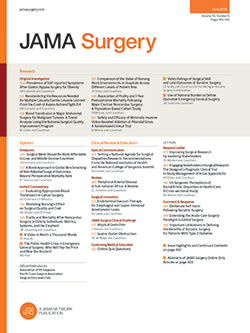 Loss of visceral fat, liver atrophy, weight loss visceroptosis, and kyphoscoliosis, which more commonly exist in older patients, have been mentioned as acquired predisposing factors.1-3 Intense peristalsis of adjacent viscera, trauma, a heavy meal, and constipation have been mentioned in the literature as possible triggering factors for gallbladder torsion but their role is not clear.3-5 The role of cholelithiasis is debatable because 70% to 80% of cases with torsion have no gallstones.3 Volvulus can be complete or incomplete. In incomplete torsion, patients have a clinical picture similar to biliary colic,6 whereas in complete torsion, the presentation is more like an acute abdomen. Volvulus interferes with venous drainage and the arterial supply and also blocks the cystic duct. The clinical picture most of the time is not distinguishable from acute cholecystitis.7 Also, although there has been some improvement in the preoperative diagnosis of the disease with advanced imaging technology, this accounts for less than 10% of cases.2,8,9 If nonoperative management and delayed cholecystectomy are chosen for cholecystitis, the correct diagnosis is even more important. Patients with gallbladder torsion do not respond to antibiotics and there is a high chance they may develop gangrene, perforation of the gallbladder, and bile peritonitis.6 Because of minimal attachment of the gallbladder to the liver, precutaneous transhepatic cholecystostomy can cause bile peritonitis and is strongly discouraged.2 Most cases in the literature have been treated with laparotomy and open cholecystectomy but there have been an increasing number of cases managed laparoscopically. Some authors have suggested rotation of the gallbladder before cholecystectomy but it was not necessary in our case. Although it is rare, gallbladder torsion should be considered in older patients with an unusual presentation of acute cholecystitis particularly when they do not respond to intravenous antibiotics. Figure 2. Floating gallbladder and twisted cystic duct. Correspondence: Guy D. Eslick, PhD, FFPH, Discipline of Surgery, The Whiteley-Martin Research Centre, Sydney Medical School, the University of Sydney, Nepean Hospital, South Block, PO Box 63, Level 5, Penrith, NSW 2751, Australia (guy.eslick@sydney.edu.au). Accepted for Publication: January 27, 2012. Author Contributions:Study concept and design: Meybodi and Cox. Analysis and interpretation of data: Eslick and Cox. Drafting of the manuscript: Meybodi. Critical revision of the manuscript for important intellectual content: Meybodi, Eslick, and Cox. Administrative, technical, and material support: Meybodi. Study supervision: Eslick and Cox.